The world of cryptocurrencies is constantly expanding, bringing in more users every day, thereby making the crypto space more interesting than ever. People around the world are diversifying their portfolio in this new asset class, resulting in new altcoins seeing the light of day every now and then. With the increase in the number of coins, the need for good wallets to store the crypto coins safely is also at an all-time high. Most investors prefer to store their crypto assets in one place to make life easier, and that is why many muti-cryptocurrency wallets are being developed. But the question is, which wallet should one pick? Which is the most reliable? With these questions in mind, I decided to list some of the best multi-cryptocurrency wallets available in the market that investors can use to store multiple cryptocurrencies. Exodus is a very popular multi-currency wallet to manage your blockchain assets. The wallet design is stylish and the user interface is rather intuitive. 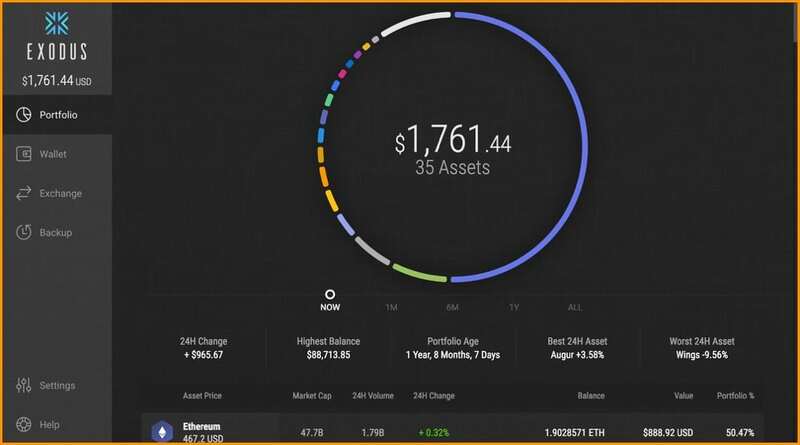 So much so, that one actually appreciates the effort put in by the Exodus team in developing the UX/UI of the wallet. The good thing is, despite the stylish design, there is no compromise on user security. It still follows the top-notch security standards of the crypto world. At present, it supports more than 30 cryptocurrencies including Bitcoin, Ethereum, Litecoin, Dogecoin, Dash, Golem, and Augur etc and there is no sign of them stopping. Support for more cryptocurrencies on Exodus is planned for the future. However, remember it is a desktop-only wallet and you require no registration or KYC for using this wallet. Of course, you certainly need to take a backup of your seed key that Exodus provides you while setting-up Exodus for the first time. Supported Operating System: Mac, Linux, and Windows. Coinomi is the brainchild of a competent team based out of London, UK, and has been on the market ever since 2015. It is also widely respected in the crypto wallet community. Moreover, by repeatedly supporting Bitcoin forks such as Bitcoin Cash, Bitcoin Gold etc., Coinomi has proved that their development team is highly dedicated. Coinomi is a multi-currency HD wallet which provides you with a 12-word backup seed key which is to be written down and kept safe. In case you damage or lose your device, this backup seed key will enable you to recover your cryptocurrencies. The magic of HD wallets is that with this seed you can manage and securely store more than 50 cryptocurrencies and 200 Ethereum tokens on the Coinomi wallet. But in the past, Coinomi has had its fair share of controversies, particularly when they exposed users’ Bitcoin addresses in plain text. However, that doesn’t mean that they are not safe – it’s just one of those things to be expected as a market-leading, mature wallet. 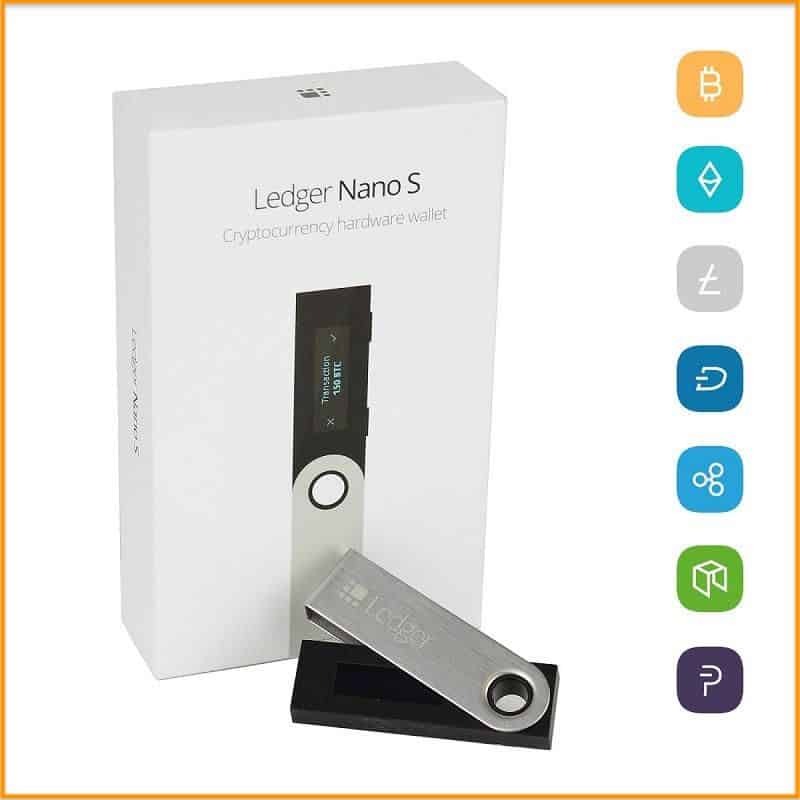 Ledger Nano S is a very popular HD wallet crafted with love in France, a European country well-known for its art and design aesthetics. Similarly, their product, the Ledger Nano S, which is also a multi-currency hardware wallet, is a very sleek flash drive-like device. It also comes with an OLED screen for easy handling and two side buttons for confirming transactions, which sometimes makes it looks like an advanced flash drive. This wallet can be used even on an infected computer to make transactions. Plus, you get the freedom to store 24 cryptocurrencies and thousands of ERC20 tokens in a single wallet. Note: Securely note down and store your 24-word recovery phrase that Ledger Nano S spits at the time of set-up. If you lose this, all you cryptocurrencies will be lost forever. Watch this video series by Coinsutra’s YouTube channel to learn everything that you need to know about Ledger Nano S.
Trezor was the first cryptocurrency wallet ever developed. It is manufactured by SatoshiLabs, a Czech Republic-based company operating since 2013. However, the initial setup is different compared to the Ledger Nano S.
With Trezor, when you first connect it to your PC, it shows a nine-digit pin code on its OLED screen. You need to enter the same pin code by clicking on your corresponding PC screen. This code is generated randomly every time you connect Trezor, which enhances safety. Once the steps above are performed, using it is pretty similar to the Ledger Nano S.
Trezor now supports more than 10 cryptocurrencies and thousands of ERC20 tokens and is available in white, gray, and black color options. Read: Which Cryptocoins Does Trezor Hardware Wallet Support? Watch this video series by Coinsutra’s YouTube channel to learn everything that you need to know about Trezor. Note: Trezor’s new model Trezor-t is also out and available on pre-bookings. Jaxx is another multi-currency wallet serving the crypto market for quite some time now. Their development team is from a Canada-based startup Decentral, that looks after the development and maintenance of Jaxx. Jaxx is an HD wallet that provides seed words so that users can be in total control of their funds as well as use this seed to recover their funds just in case something goes wrong with the device. Also, there are no email signups, KYC or any kind of registration to use the Jaxx wallet. At present, Jaxx supports more than 55 cryptocurrencies and tokens in a single interface which is quite commendable. Here is the list of all supported currencies. It is important to have good wallets for different cryptocurrencies. If you rely on exchanges, you are just probably waiting to be hacked. However, I understand that finding multi-currency wallets for many currencies is not possible. Therefore, you should try their official crypto wallets to keep your funds safe. I hope this detailed article on the different types of multi-currency wallets – including mobile, hardware, and desktop wallets – will help you in making the right choice for yourself. Do let me know which multi-currency wallet you use for your cryptocurrencies in the comments section below. If you find this post useful, do share it with your friends on Facebook & Twitter! How Much Bitcoin Transaction Fees Should You Pay For Confirmed Transaction? I prefer more cold wallets as mentioned in this article. I’d rather use the one that supports multiple digital currencies. Hardware wallets look handy, but they are not as safe as paper wallets. There are a lot of cryptowallet that are available now for keeping and storing the digital currency. Most of the crypto wallet you mentioned are good. If you’re going to ask me, I prefer to use an offline crypto wallet. I believe that it is better to use because there’s only a little possibility of hacking it.